I have this immense love for finding new software, web services alternatives to the ones I am already using. ShanKrila is a direct by product of that. I am always on the lookout for new & better software, that improved my productivity, let me keep my computer resources down and working on my computer a total fun experience. Wakoopa was one such site I reviewed here recently, that let you share the software you used with others and also let you find what software are popular with other Wakoopa users. A social network to find good software, if you will. AlternativeTo is a web service that lets you discover alternatives to popular software in not just Windows but also Mac & Linux. It even suggests alternatives to online services. If you have a software that makes you pull your hair out and want to replace it with something better, that’s when you’d want to go to AlterntiveTo. Unless, you have the same addiction as me to find new cool stuff all the time. 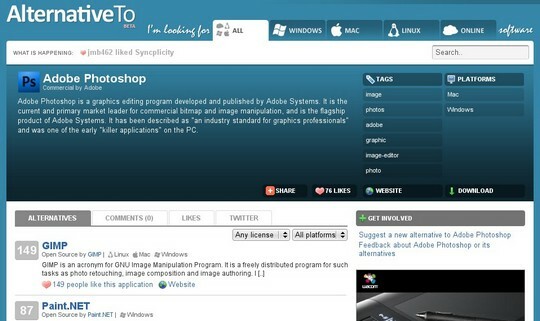 AlternativeTo basically creates a page for each software. And the alternatives are user generated and the best ones get to the top through user votes. So, if you are looking for a Photoshop alternative, you’ll find Gimp and Paint.Net at the top of the dozens of alternatives out there. As you can see in the screenshot, I like the way each software has tags that lets us explore further categories. For eg. Photoshop has tags like image, image editor, photos, etc opening up further possibilities to find more useful software. Wakoopa was Windows only. I can use AlternativeTo to find better Linux programs as well. You can create an account at AlternativeTo and show your support for your favorite software. This will help others find the ones you consider useful plus you can find what others like. Also, your reputation score increases as you vote and enter your own suggestions for software alternatives. AlternativeTo is an interesting attempt at a not so new idea. But it is very well executed with an intuitive layout and the comprehensive OS coverage. For someone using multiple OS’es this will be great one-stop shop to find better software alternatives. As the community grows around this site, it stands to become a force to reckon with. For now, I will be hanging out there trying to see which of my age old software I can get rid of. I was just going thru AlternativeTo and found it quite well laid out. Reminded me of another similar site – Deligio.